What’s an SMI member with a bad 401(k) plan to do? In this case, “bad,” means a plan with limited investment options. SMI’s Personal Portfolio Tracker, available to both Basic and Premium members, was designed with that scenario in mind. If you’re not making use of this powerful member benefit, hopefully you’ll be motivated to do so by the time you’re done reading this article. According to the Investment Company Institute and Brightscope, the average 401(k) plan offers 25 investment options. For many investors who try to select mutual funds on their own, that’s too many choices. However, for SMI members trying to implement Fund Upgrading, it can appear to be too few. Fund Upgrading classifies stock mutual funds into five “risk categories” — large-company value, large-company growth, small-company value, small-company growth, and foreign. Within each of those segments, we run a monthly analysis of the momentum scores of hundreds of funds and recommend those with scores in the top 25% of each risk category. By design, the more funds to evaluate, the better. If your workplace retirement plan gives you access to a “brokerage window,” you should have no problem implementing Fund Upgrading. That’s because a brokerage window offers access to all the mutual funds the company administering your 401(k) plan (such as Fidelity, Vanguard, Schwab, etc.) makes available on their brokerage platform. In other words, you’re not restricted to your 401(k) plan’s specific options; you have a wide world of options from which to choose. While an increasing number of plans have made brokerage windows available, those plans are still in the minority. Most plans offer a much more limited menu of investment options, and that can make implementing Fund Upgrading within such plans a challenge. If you don’t have access to a brokerage window, don’t despair. Go ahead and create a portfolio of your 401(k) options in the SMI Tracker tool. When you “View” your portfolio, you’ll initially find your funds organized into SMI’s five risk categories. If you have numerous funds available in each of the risk categories, that’s a good sign. 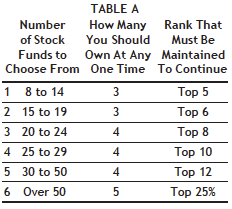 Your hope every month is to have at least one fund in each category to have a “Percentile” ranking of 1-25, which means the fund’s momentum score places it in the top quartile of all of the funds in that category. Ideally, each month there would be at least one fund in each of the five risk categories that’s in the top quartile. If you don’t have numerous funds in each category, or if none of the funds you do have are in the top quartile, switch to the Tracker’s “Momentum View.” That view ranks all of the funds you have access to in order of their momentum scores, irrespective of risk category. This is an acceptable alternative way to use Fund Upgrading to make fund choices within your workplace plan. Recently we asked several SMI members to send us a list of the funds available to them in their 401(k) or 403(b) plan. 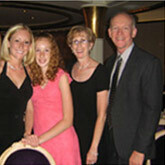 One such member has access only to the GuideStone funds, a family of Christian-screened mutual funds. Because GuideStone may be a common offering available to SMI members who work for ministry organizations, we tested it to see how the Tracker’s Momentum View would have helped manage such a portfolio in recent years. After eliminating GuideStone’s bond, money-market, asset-allocation, and target-date funds, (none of which are typically used in a momentum strategy) nine funds were left to enter into the Tracker. 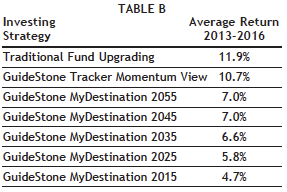 With that number of funds, SMI recommends initially investing in the three funds with the highest momentum, as shown in Table A, scenario 1. As time passes and funds move up and down the Tracker’s rankings, you would continue to hold a fund as long as it remains ranked in the Top 5. Because some of GuideStone’s funds are relatively new and have short track records, we went back only four years in our research. Table B shows the average annual returns from 2013-2016. It compares the performance of an investor using the Tracker’s Momentum View for making buy/sell decisions with the performance of traditional Fund Upgrading and each of GuideStone’s target-date funds (since such funds have become the common default choice among workplace-plan investors). While the choices made using the Tracker’s Momentum View would not have outpaced SMI’s traditional Fund Upgrading, the performance was very respectable, especially given how few funds were available. But where the Momentum View really shined was in comparison to the available target-date funds. It’s true that it would have taken more work to manage this portfolio using the Tracker rather than simply buying and holding a target-date fund. In this four-year case study, using the Tracker would have required making three trades each year. That’s a small price to pay for a nearly 4 percentage point average annual performance improvement over GuideStone MyDestination 2055, the most aggressive target-date fund (that is, the one with the highest stock allocation due to its lengthy time horizon and so most likely to do well in a rising market). If you’re not managing your workplace retirement plan with the help of SMI’s Personal Portfolio Tracker, give it a try. You are likely to find it easy to use and well worth your time. How Well Do Target-Date Funds Perform in a Downturn?